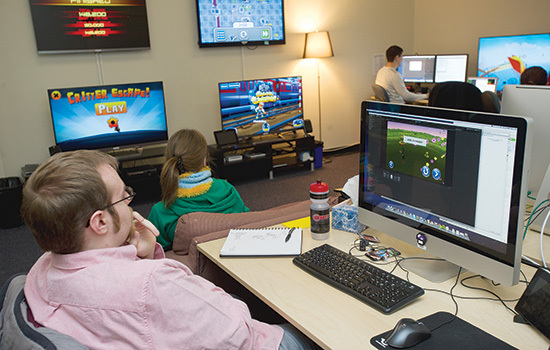 Employees of Darkwind Media spend their days enabling video games to be played &#8232;on new platforms, testing and debugging games and creating new games. In its &#8232;sixth year, revenue has doubled each year for the business, which is based in RIT’s Venture Creations. It seems like a dream job any computer geek would enjoy: spend hours each day playing video games and getting paid for it. For the 20 employees of Darkwind Media, creating, designing, debugging and converting video games to other platforms is what they do. A glimpse inside their office at RIT’s Venture Creations makes visitors think they have stepped into an arcade. There are three 55-inch screens on the wall in front of a spacious couch, and other employees engrossed with their desktop monitors or laptops, playing animated rounds of golf, attempting to kill robot invaders or solve a puzzle. “Everybody thinks it’s a wonderful thing until they do it,” says Colin Doody, who founded Darkwind Media in 2007 with fellow information technology major Matthew Mikuszewski and software engineering majors Brian Johnstone and Scott Flynn. Darkwind Media’s focus has changed since the business started. While students at RIT, they worked on software engineering projects and found enough business creating websites to get more work involving visualization software. But they noticed the video gaming industry taking the lead in the business world. Companies want their games to be played on other platforms, whether they are iPhones, Blackberry devices or PCs. Today, much of Darkwind’s revenue comes from companies with existing games who want to convert them so they can be played on other devices, some devices that may not even be available to the public yet. The other part of their revenue comes from game development. Mikuszewski says now they turn down website creating and consulting jobs to focus on their work to develop games and new gaming technology. A significant number of Darkwind’s employees are co-op students from RIT, who studied software engineering, game design or graphics. Most of their clients find them by word of mouth, with recommendations from other clients. And it doesn’t sound like they need to, at least not right away. Darkwind has doubled its revenue and made a profit every year. Three employees now work in a second office Darkwind opened earlier this year in Lowell, Mass., near Flynn’s hometown. “By diversifying regionally, we can attract newer people,” Doody says. When the time comes for them to leave Venture Creations, which helps start-up companies associated with RIT and its students, he says Darkwind will find office space near RIT. Darkwind hopes to continue creating gaming technology for new and emerging platforms while creating new games at the same time. The video gaming industry is expected to take in $70 billion a year by 2015.